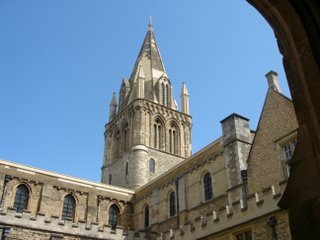 New College was founded in 1379 by William of Wyckeham. I think the pictures speak volumes of the faith. The cloister and the grounds are some of the most beautiful I've seen in Oxford so far...part of the ancient city wall forms the north side of the gardens. Every three years, the Principal of New College, the Lord Mayor and the Dean of the Chapel have a ceremonial inspection of the city's defences, something they have been doing since 1379 as part of the agreement to found a college right on the city's then boundaries. The Chapel, like many of the other Chapels, is set in the collegiate style...all members of New College (men, of course) were not only studying their various subjects, but were preparing for priesthood in the Church. 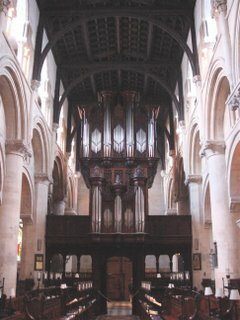 The 'collegiate' style of seating is really a 'monastic' style, that allows for antiphonal singing of the psalms and the Eucharist. What I have found interesting is the spectacular-ness of some of the chapels, and the seemingly light concern for aesthetic considerations like cleanliness, clutter, and the quality and style of newer furnishings. 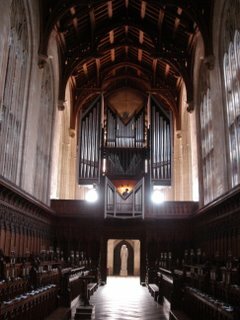 At Mansfield College, earlier this afternoon, the Chapel (built in the 19th C. to look much older,) the original woodwork and carving is done in a darkly stained oak, ornately carved, and quite lovely. The jarrring contrast comes from the modern blond-wood chairs in the main chapel and the haphazardly stacked piles of unused chairs, tables and microphone stands in what once was a lovely ante-chapel. Is it evidence of the state of spirituality at these colleges? Is it just that no-one has taken a critical eye to these spaces to see what it is they say when the places look dilapidated and carelessly used? We've all been given a great responsibility, either here at Mansfield or New, or at home at Boston University to care for these spaces. I am actually rather pleased at how carefully we attend to how Marsh Chapel looks. Perhaps, in half a millenium, someone will walk into Marsh Chapel and muse about the same things. Hopefully, they will find a vibrant faith evidenced in the sense that someone is caring for the space...that it feels like someone cares what it looks like. Perhaps I am just too retentive about these things and miss the point, but I don't think so. 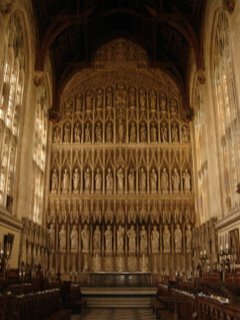 I find myself wanting to care for the 14th c. New College Chapel in the same way I care for my own...to make sure that it is washed up and puts its best face forward; for God, and for those who come to pray and worship. A friend and colleage of mine, a graduate of Mansfield, rightly took me to task about my comments regarding the Mansfield chapel. In musing about these things, I did not take into account the achievements of the college in its rapid growth, nor did I see beyond the surroundings to the lively spiritual life that does occur there. If I've offended anyone, please accept my apologies. 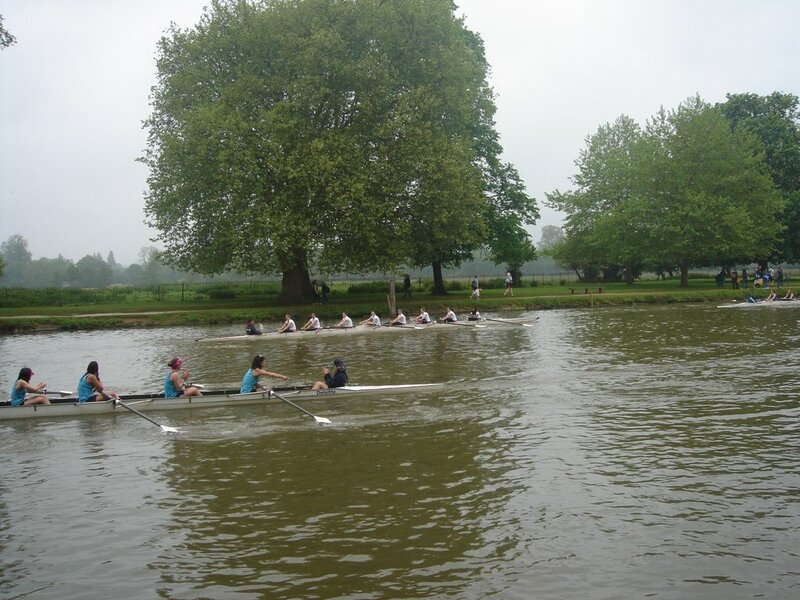 Rowing. Oxford. 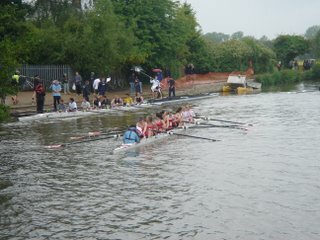 The Thames. What more is there to say? It was very civilised and exciting. 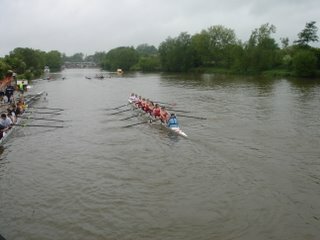 The men's boat 'bumped' the boat in front of them (that's the point in a narrow river) to win blades. The women's boat was bumped, (not the point...to be avoided at all costs) and therefore will start one place back next year. "...we mark this, our Parish Boundary, in the name of the Father, the Son, and the Holy Spirit, Amen. Today is Ascension Day, when Christians celebrate the event in Scripture when Jesus was assumed bodily into heaven to sit at the right hand of God, the Father. 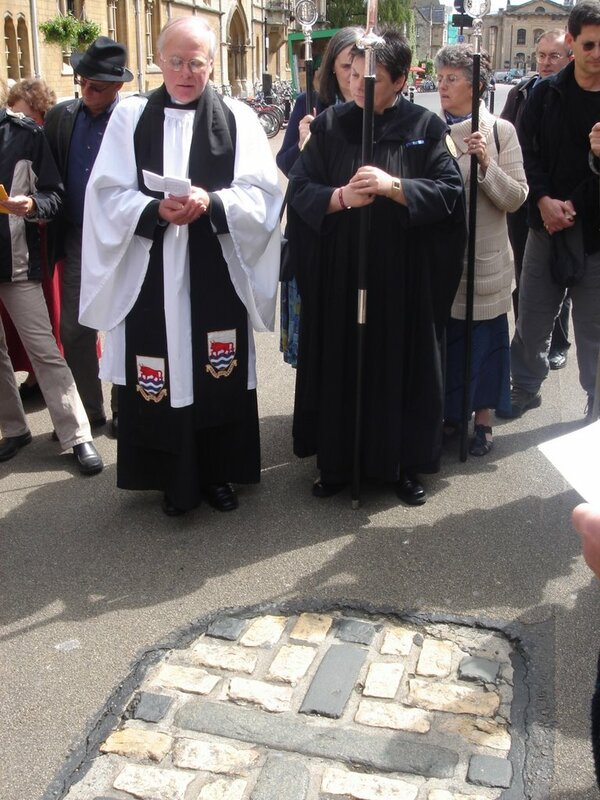 Some time in the 14th c., parishioners at St. Michael's at the North Gate decided that Ascension Day would be a good day to walk around Oxford, checking to see that the stone markers that delineated the parish boundaries had not been moved or stolen or somehow altered in the previous year. This mattered, (and still does) in England, because boundaries of the Church of England parishes mark out governmental territories for things like marriage, birth and death records. So, today, I attended 9:00 Holy Eucharist at S.M.N.G. followed by the annual 'Beating of the Bounds' of the parish. 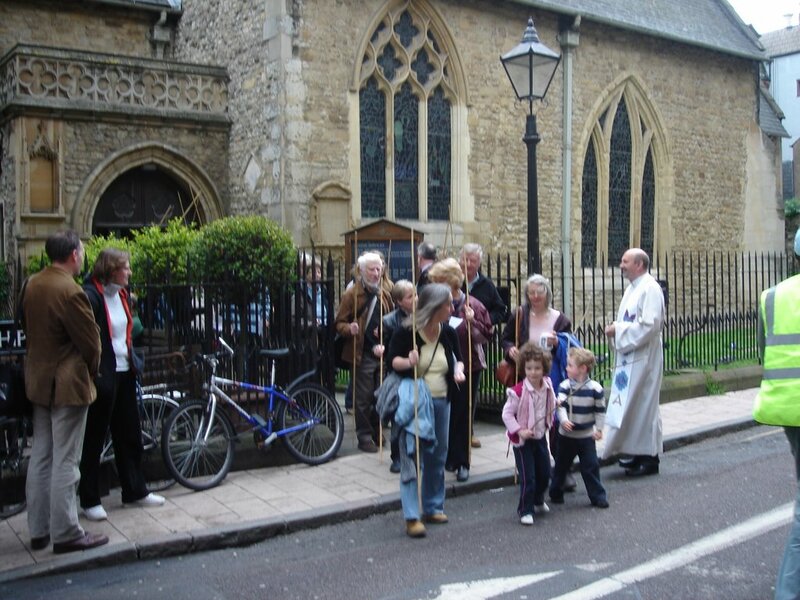 Following the postlude, we all exited the church and were handed an 8' long green willow wand, and marched directly onto Cornmarket Street to find the first boundary marker. 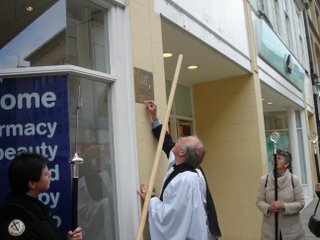 Sure enough, on the front of a Boots Pharmacy, there was a brass marker attached to the front of the building. I should say that the Processional down the street was headed by the Crucifer, two Vergers, and Priest, in full vestments. 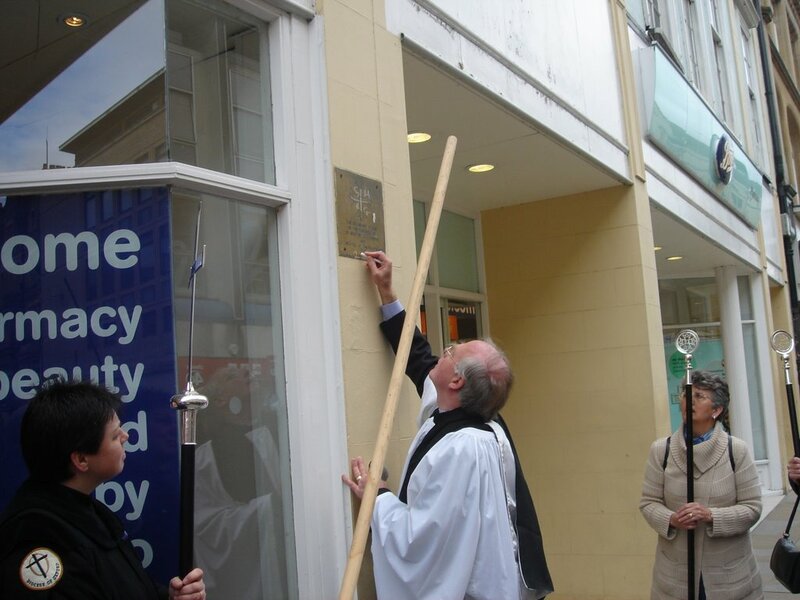 Upon arriving at the first marker, the Priest read a collect, and then proceeded to mark the brass plaque with a cross, the initials S.M.N.G (St. Michael's at the North Gate) and the year (2006) with a piece of chalk. The 150 persons in the Procession were then invited to strike the marker three times with their willow wands crying out "Mark! Mark! Mark!" It was quite a scene. We proceeded into a back corridor of the Clarendon Shopping Center, across the street to New Inn Hall lane to a marker in the garden of St. Peter's College, back up New Hall Inn St. to another marker on a wall behind a skip (dumpster) where we prayed for a more environmentally aware society...and on and on. On the Broad St., we stopped at a stone cross set into the street and prayed for the souls of Archbishop Cranmer, and Bishops Ridley and Latimer, who were martyred by fire in front of Balliol college in 1555 and 1556 by Queen Mary for refusing to renounce their faith in the English Church and return to Roman Catholicism. At Brasenose College, we stopped for refreshments. We also ran across a group doing the same thing from the University Church...St. Mary the Virgin. 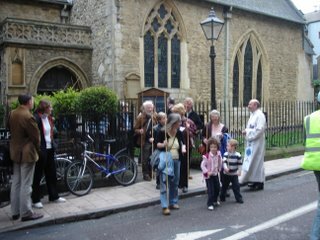 I left the Procession just as we were leaving Brasenose College and they were on their way to Lincoln College across The Broad Street, where the group would have lunch and ivy beer. It was incomprehensible to me that businesses, normally very private Oxford colleges and the Lord Mayor of Oxford (who read the Gospel at the Mass - S.M.N.G. 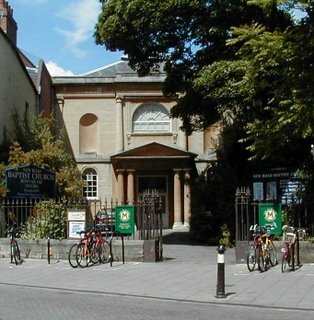 is the Oxford City Church, where S.M.V. is the University Church) would allow such a thing to happen. Nearly 200 people of all ages walked all through the center of Oxford, through normally off-limit areas of businesses and colleges. More incomprehensible is the thought that S.M.N.G. has records of this happening every year since 1430 or so, and think that it was happening for at least two centuries before that. The Priest was very appreciative that so many people showed up and it was clear that he took his responsibility for making sure that this event happened and went well very seriously. An annual event that has happened for nearly a millenium is something to be cherished and encouraged to thrive. It was a wonderful day and I am glad I experienced it. Marching through Oxford with an eight foot long willow stave in the way that people have done longer than almost anyone can comprehend made me feel a part of an incredible history. Today, when I went to study at the Bodleian Library, I was handed a small piece of paper on which was printed the following, and asked to read it out loud in Latin. Do fidem me nullum librum vel instrumentum aliamve quam rem ad bibliothecam pertinentem, vel ibi custodiae causa depositam, aut e bibliotheca sublaturum esse, aut foedaturum deformaturum aliove quo modo laesurum; item neque ignem nec flammam in bibliothecam inlaturum vel in ea accensurum, neque fumo nicotantio aliove quovis ibi usururm; item promitto me omnes leges ad bibliothecam Bodleianam attinentes semper observaturum esse. I hereby pledge by faith not to remove from the Library, nor to mark, deface, or injure in any way, any volume, document or other object belonging to it or in its custody; not to bring into the Library, or kindle therein, any fire or flame, and not to smoke in the Library; and I promise to observe all the rules of the Bodleian Library. 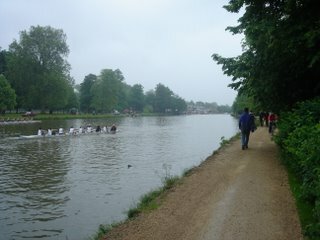 Earlier in the day, I visted Frogmore and Windsor, but more about that after I've had a nap. 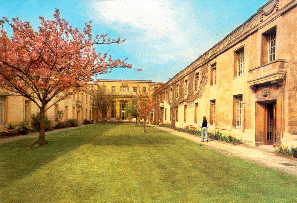 The Bodleian was founded in 1602, here's the web site for more info. 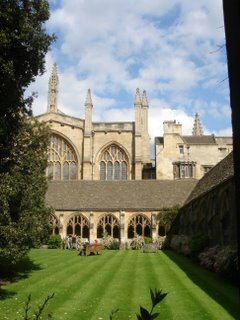 This morning I went to Christ Church for a tour. 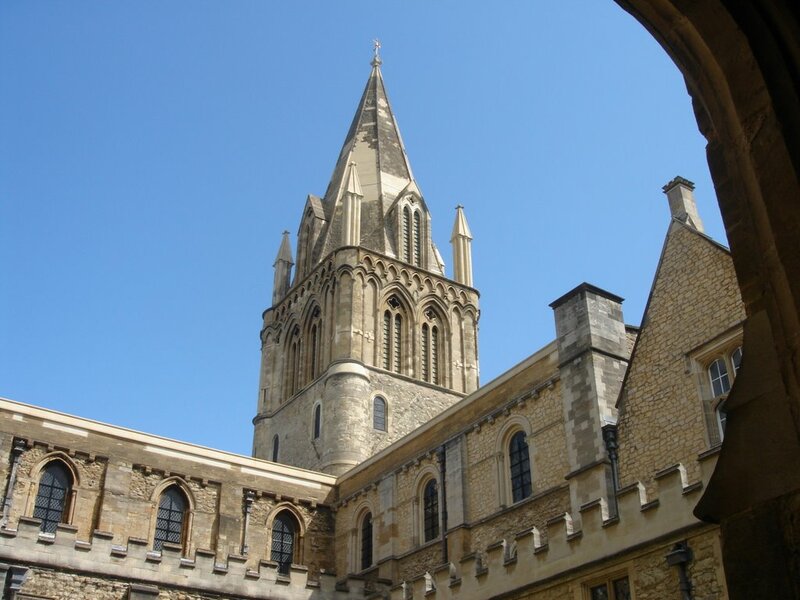 One of the oldest Colleges in Oxford, it was originally founded as a monastery to honor St. Frideswide, who lived on the site in the 7th c. The Cathedral was originally constructed in the 12th c...the tower is Norman and one of the oldest in England. Cardinal Wolsey ordered the monastery closed and torn down in 1525 so that he could found a college on the site. 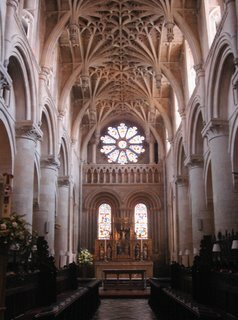 His dreams of a much grander college and church were never realised, only the west transept of the church was torn down and remains unbuilt to this day. 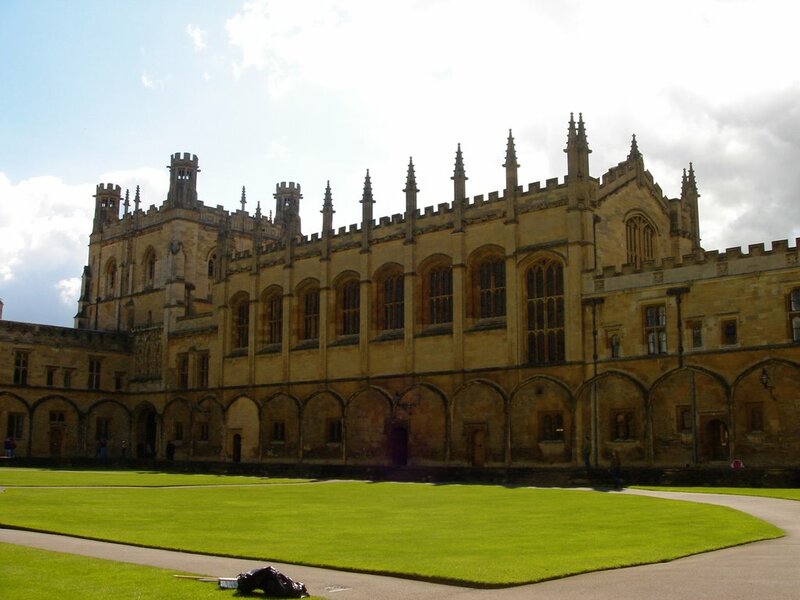 In 1546, Henry VIII renamed the college and church which had become the Cathedral of the Diocese of Oxford in 1542 as Christ Church. 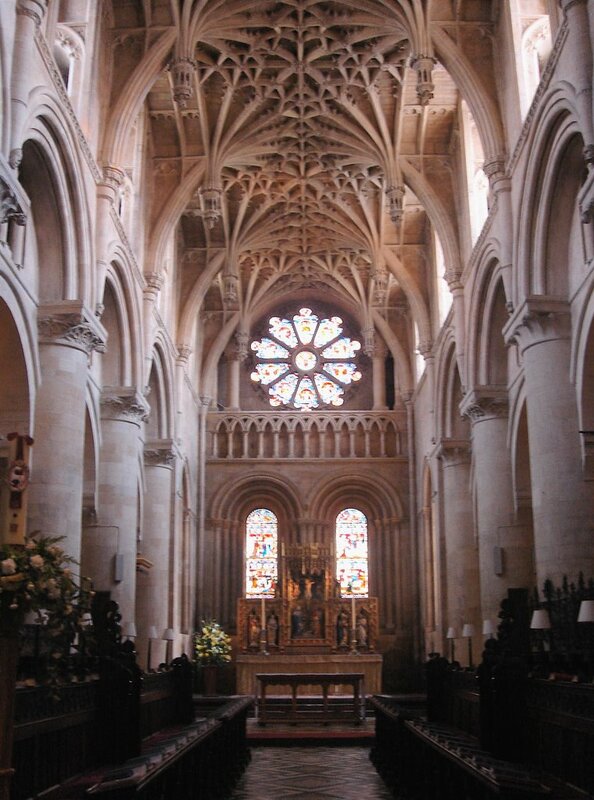 The Cathedral remained a royalist stronghold throught the Civil war of the 17th c., and in 1720, John and Charles Wesley were ordained in the Cathedral where they had read for degrees in Theology as students of the college. 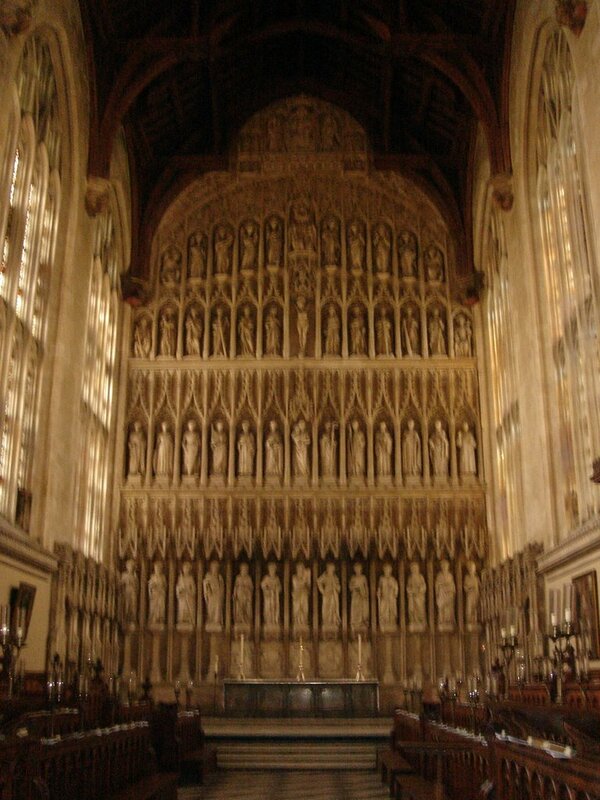 The Cathedral Choir was founded in 1525 and remains one of the best choirs in England. I plan to attend Evensong one night, sung daily at 6 p.m. While I was there today, it was very quiet. One of the elderly docents, a volunteer, grabbed me by the arm and asked if I wanted to see something special. Through a side door, up a small flight of ancient stairs, we emerged into a small walled garden. 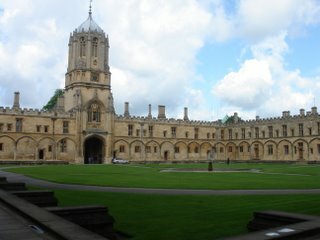 On the left was one wing of the main quadrangle, student and tutor accomodations. She told me that this was the garden that Charles Lutwidge Dodgson, otherwise known as Lewis Carroll could see from his window. (Dodgson was a Tutor in Mathematics at Christ Church, though he had been a student there as well...) The Dean of the Cathedral at the time had a young daughter named Alice. One day, Alice was out on the lawn playing with her pet white rabbit and the large orange tabby cat that lived in the garden. Girl, rabbit and cat suddenly disappeared through a tiny green door in the garden wall back into the Deanery. Inspired, Dodgson wrote "Alice's Adventures in Wonderland" in 1865 and a later volume "Through The Looking Glass" in 1872. Cornmarket St. in the rain. The remarkable thing about the rain here is how constant it is. All day today, it has rained off and on...one minute there is sun, and the next minute there is a rain that can come down quite hard. Everyone has an umbrella with them most of the time, and most people have a raincoat handy. It's actually been a lovely day, despite the rain, to walk around. I'm told that it has been a dry winter and there is threat of a drought. 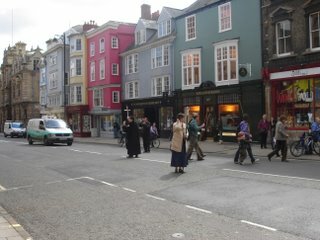 This picture looks south down Cornmarket St. in the center of Oxford. To the left, the tall stone tower is a Saxon guard tower that is now part of the C of E church of St. Michael's at the Gates. It was built in 1040. Further down, as far as your eye can travel is Tom Tower, the front gate to Christ Church. This evening, I took a short walk after dinner at the Eagle & Child Pub. Out the door, straight across St. Giles, down the Lamb & Flag passage through to Parks Drive, right past St. John's College to Broad St. where the Bodlian, the Radcliffe Camera and the Sheldonian Theater are. I'll post pictures of those places later. 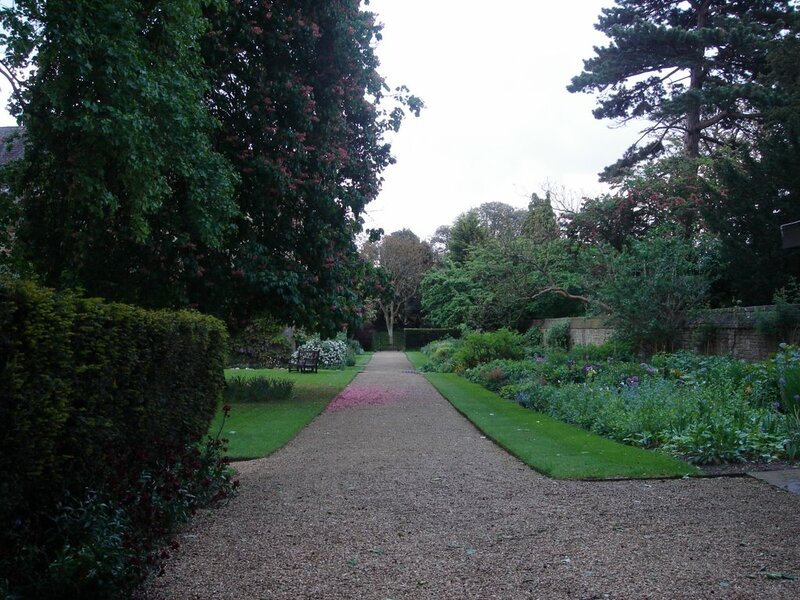 Tonight, just two pictures...a shot of the side garden at Rhodes House and the small house next door. 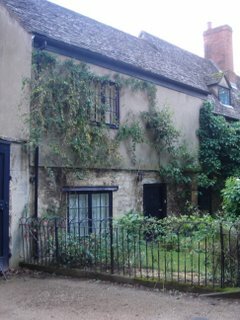 The sign on the house said it was built in 1559...and the front door is not much more than four feet high. I would have to duck! Very nice cat in the garden as well, who was happy to greet me, but camera shy. This morning I attended the 10:30 worship service at New Road Baptist Church. The student in the room next to mine, James Webber, from Wales was to be baptised and invited the students here at Regent's Park College to come. The service was very nice, and everyone was very, very friendly. 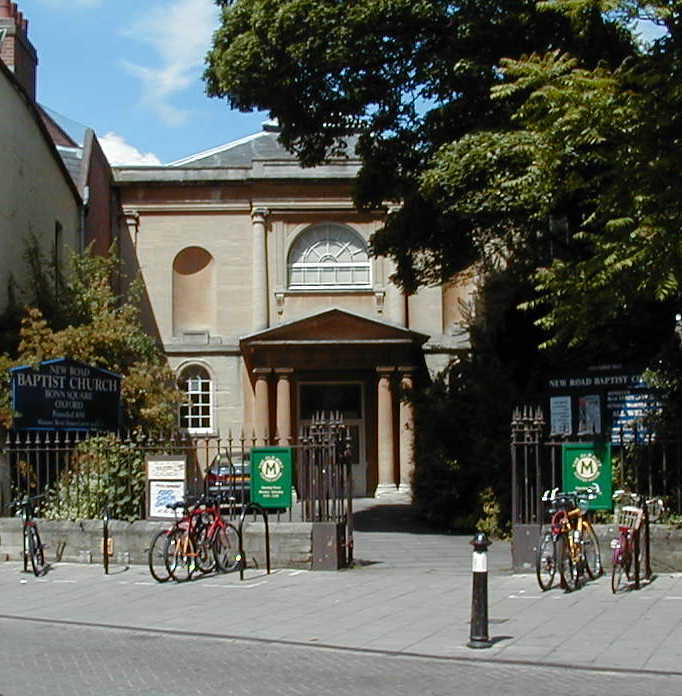 Regent's Park college is the theological college in Oxford for training of Baptist ministers, so several of the students, faculty and the Principal, Prof. Fiddes are all members of New Road. In fact, it was Prof. Fiddes' turn to help out with coffee hour, and when I left, he was elbows deep in the sink washing up...an excellent example to the students of Christian humility. It has been nice to be able to attend church and not have to worry about it. (Though, this morning, my liturgical observer's eye was on for just a minute or two...as with most free-church congregations, there were things done in the liturgy that I suspect have not been well thought through as to why they are there in the liturgy...remnants of either anti-papism, or older memories than that of liturgical custom that have been retained as tradition and not reappropriated or reexamined for usefulness and appropriateness for today.) Nevertheless, the service was very nice, the singing was robust...(English hymnals have words only, no music generally!) A nice mix of traditional and contemporary, more than we do at Marsh Chapel. The minister's sermon was quite good, though it is clear that he is more conservative theolgically than I would be comfortable listening to for any length of time. Nice enough fellow, and gave me lots to think about. Yesterday, I attended Pusey House, the Anglo-Catholic chapel attached to St. Cross College just next door...also beautiful in its own right and frankly, more to my liking than the Baptist service I attended. Excellent choir sang a Missa Brevis by Walton and the Parsons Ave Maria, one of my favourites that the Marsh Chapel Choir often sings. I will be attending daily prayer there as often as I can, since it is so close. Oxford was the center for liturgical renewal and the Anglo-Catholic movement in the 19th c. (the Oxford Movement and the Tractarian Movement) so it is quite wonderful to experience that style of worship in the very chapels where it started off. I will be attending Christ Church Cathedral at some point while I am here. I also will be attending Wesley Memorial Methodist Church at some point while here...the Wesleys were both educated here at Oxford. It is really quite amazing the amount of religious change and fervour that has come out of Oxford, and continues until today. 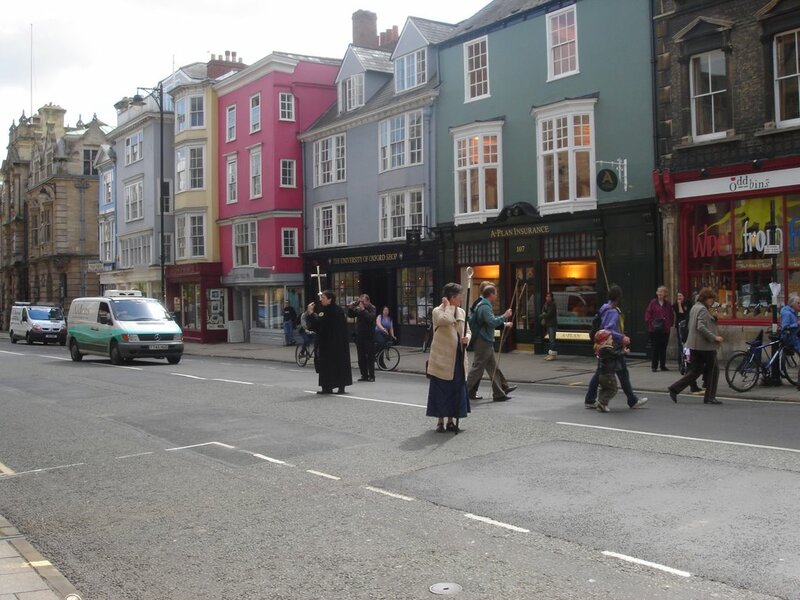 Walking to the church this morning, I heard no fewer than ten different churches ringing bells, some with quite complicated change-ringing, calling the faithful to prayers and worship, and the fairly crowded streets of people doing just that. This evening, I am going to go to Choral Evensong at St. Mary Magdalen which is also nearby. Right...I've become aware that some of you readers (Mom and Dad...) might not know how to comment on things I've written if you wish to. At the bottom of each posting, there is a line that says "0 Comments" in purple. Place your cursor (the blinky thing) over it and click on it. A new window will open. with a place to type your thoughts. If you don't have a Blogger account (you don't need one to post) choose the "other" option, type in who you are etc. At the bottom, you have to fill in the secret code word...this is for security so I don't get a million postings trying to sell me things that I don't need or want. Well, it has been an amazing few days. I arrived on Wednesday morning very early where Dr. Sheppy picked me up from Heathrow. I was immediately plunged into a culture that on the surface seemed familiar, but in many ways is as foreign as anyplace else in the world I could go. Driving on the opposite side of the road, road signs that I don't understand; electrical outlets and an approach to electronics in general that is quite different are all things I have had to adapt to very quickly. Dr. Sheppy graciously brought me to his home in Reading where I could freshen up and change clothes after my overnight flight. After a brief tour of Reading (saw the prison where Oscar Wilde was imprisoned for "buggery" in the 19th c.) We made for Oxford. Arrived at Regent's Park College after driving through Oxford. A quick trip through the office to collect keys and access cards to get into and out of the College and my room and I had arrived. The doors all have access codes to get in and out of…security has been a problem here at Regent's Park occasionally. So many things and subtle customs to learn. Mealtimes are quite precise and in college at least, not to be lingered over. The food is not very good, but hot and there is lots of it. I have been admitted to the Middle Common Room, really both a place and an idea…the place is a nice lounge in the basement where graduate students gather for socializing, coffee and computer access. Also, being a member of the MCR conveys status in the community. 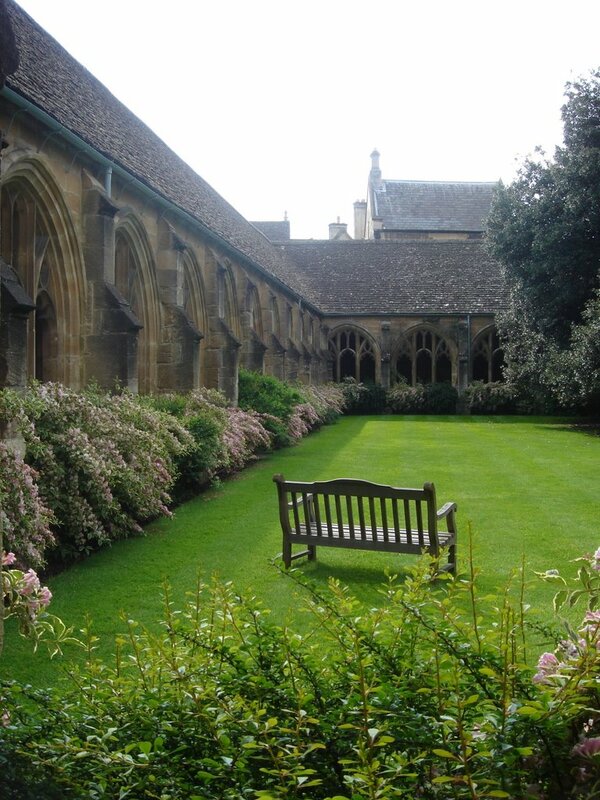 The Junior Common Room (JCR) is the gathering room for the undergraduates; it is their social organization as well. The Senior Common Room is to be entered only on invitation of a fellow of the College (a member of the faculty or senior administrative staff). Members of the MCR are invited to coffee following Formal Hall on Fridays. Formal Hall (think dinner at Hogwarts!) The Fellows and guests sit at High Table (I was invited to do so this week). Students wear academic robes that distinguish their status. Undergraduates can be commoners or scholars (the scholars robe is longer). Graduate student robes are different again, and the Fellows robes are different again depending on rank and degree; absolutely fascinating for someone who follows this stuff (like me!). Noone sits to eat until the Principal (think Dean) of the College says grace, noone eats until he has been served and picks up his silverwear, and noone leaves until dismissed by the Principal unless it is dire, and then there is a protocol for departure. I've walked around Oxford a bit since arriving, but I can’t quite access anything except the tourist venues because I haven't got my University ID card yet Once that arrives, hopefully on Monday, I'll be able to bypass the tourist lines outside of the big famous Colleges (Christ Church, Merton, New, Balliol) and be able to visit chapels and libraries. The Bodleian is amazing. The upper library (the one above ground) is ancient and impressive, but more impressive is the seven stories of subterranean stacks that only the "Bod Trolls" access; librarians who rarely see the sun. Apparently there is a very low turn-over rate because the pay is so good because the conditions are so challenging. Everything is so ancient. 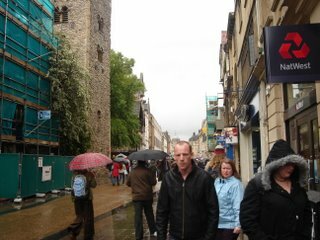 There is a church in the center of town (St. Giles) that has a tower built in 1040; yes, that is 26 years before the Battle of Hastings and the signing of the Magna Carta that established England as a nation. 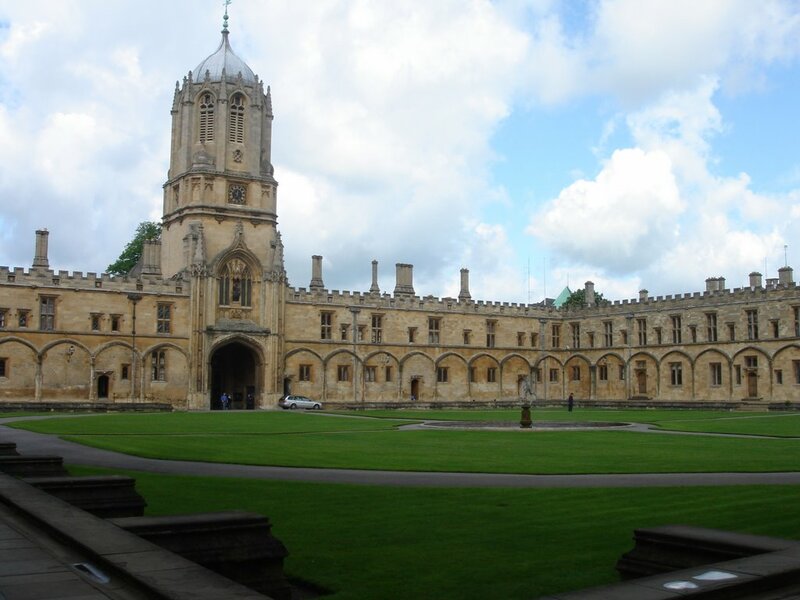 Oxford scholars think there were university students here as early as the 14th c.; refugees from the University of Paris who could not return because of some war or another. Everything has a historical marker on it and I have to really resist the temptation to read every single sign marker as I walk down the street; I'd never get anywhere! People have been so friendly. I'm sitting just now at the Lamb & Flag, a pub owned by St. John's College and a very lovely young woman named Mel introduced herself. Apparently it is unusual to be sitting at the bar working on your laptop. Jim, the head Steward at the dining hall at Regent's Park has been very friendly. Two men I met at the Eagle & Child the other night could tell that I was travel weary and new to Oxford. They apparently run the Oxford Brewer's Festival and were very happy to introduce me to local Oxford beer and tell me about some of the other pubs I must visit while I am here. Interesting to note; the Eagle & Child is the pub that a group called "The Inklings" met at from the 1920s into the 1960s on Tuesday mornings, to discuss their latest writing projects. Its been a pub since the late 17th c. so has some history to it. Anyway, Two members of the Inklings group were JRR Tolkein and C.S. Lewis. I've sat at their table. More later. I've met some excellent students, some Americans, and already had some great times that I will not soon forget. I'll have some pictures in a few days too. I've only just found a converter that will work with the charger for the battery for my camera so I haven't taken any pictures yet. Well, I've arrived safely in Oxford. No pictures today...it has been a busy day of getting through Heathrow, picked up by my professor and brought to Oxford where I was given a crash orientation. It's all a little overwhelming and so I am feeling a bit overloaded. More tomorrow, I promise. Oh, and like Boston, it's raining here. I hope its a nice day tomorrow. Everyone has been so welcoming and nice. I am blogging today from the Emack & Bolio's on Center St. in Jamaica Plain. I'm surrounded by other folks my age, all mostly on laptop computers, working away diligently on whatever projects we are working on. This is a cool place; there is good coffee, good sugar-free ice cream, and cool music that I don't ordinarily listen to. I come here sometimes when I have writer's block...there are no domestic distractions and I am good at tuning out the people around me. What is odd is the anti-conversationalism that occurs here...this time of day E&B is always full of people like me typing away working hard...there is free wi-fi internet access and I suspect that a handful of the people here come here for the free internet access. Talking to one another occurs in hushed tones and if a conversation gets too lively, looks of disapproval are swift and sure. I leave for Oxford in a week. My tuition and room and board are paid. I've been in touch with Dr. Sheppy and the Bursar. I do need to bring black-tie for 'formal hall' on June 6th...and I will be borrowing an academic gown for other Fridays. I am sure that Dr. Sheppy finds my enthusiasm for what are probably tired rituals of college life at Oxford to be a bit odd, but I don't care. I may never have the opportunity to experience this sort of academic life again, and the little taste of it I will get during my six weeks there I will have to savor for the rest of my life. One of the things I will be doing while in Oxford, aside from my research, will be to really examine whether or not it would be feasible for Darrick and I to live in the UK. The language is roughly the same, but aside from that the culture is greatly different from what we know here in the US. There are greater class distinctions, particularly in academic circles. It is more expensive in many ways. We would still be able to have legal recognition of our marriage, though the details of that would be slightly different. We would have to find work, certainly possible. We would have to go through a very careful series of steps to bring the cats directly into the UK without quarantine, if they were still with us when we travelled. All these things would require careful planning and careful deliberation. But I hope to come home with a better sense of the possibility. I love my position at Boston University, so we are in no rush to move...but we both love the UK, and it would certainly be a grand adventure while we were both young enough to accomplish it. I am an ordained United Church of Christ pastor with 15 years of parish and chaplaincy experience, advanced degrees in the study of worship and liturgy, and experience teaching both lay people and seminarians in the arts, practice, history and theory of worship. Leo Leonni is a genius. I think ministry is a lot like what Frederick thinks is important. All original content on this website is the exclusive intellectual property of the Rev. James J. Olson, all rights reserved. Reprints on paper or on other websites are not permitted without the expressed written consent of the author.